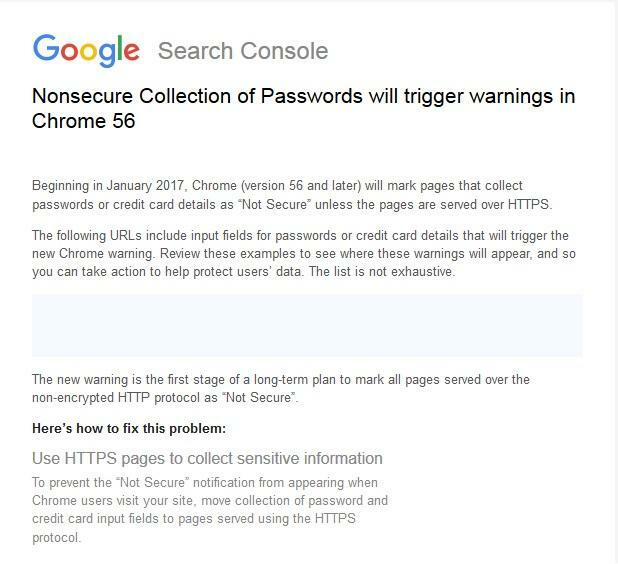 You may have already received the warning email from Google Search Console about their long-term plan to mark all pages served over the non-encrypted HTTP protocol as "Not Secure" in Google Chrome. Google has rolled out major changes to the way non-https sites were handled in Chrome in January. It is crucial to switch to HTTPS before Google Chrome start to show a security warning for HTTP pages when a user visits your website. You can find more information about where Google is heading with this initiative with the following post "Moving Towards a More Secure Web". Rest assured that SeoSamba is here to help you cope with the ever changing technology landscape. We can certainly address any specific issue brought up in these messages as part of our web mastering services, however given the overall trend at hand, we suggest to save time & money by moving your website to the HTTPS protocol. Setup price is $350 and includes an SSL certificate valid for 2 years; dedicated IP provisioning, website move, and leasing costs when necessary; and One on One 301 redirections implementation (I.e: from http://domain.com/abc.html to https://domain.com/abc.html) which is critical to maintain benefits from your SEO efforts. SSL certificate renewal/admin/setup for each year thereafter is $100. I am at your disposal in case you have questions.